“Can I have a model answer please sir?” A question I sometimes get asked in Psychology lessons from my learners. I am pretty reluctant to simply just give them the model answer just like that. This activity helps students to think about essay structure, logic and coherence. It gets learners working with the material and picking and choosing points of description and evaluation for themselves. Have a model answer ready. Divide answer into paragraphs, with a mixture of Description and Evaluation points. These could be in the form of text boxes, but mixed up on a page of A3 paper. Students in pairs or small groups are asked to cut up the text boxes. Students then attempt to create an essay picking and choosing appropriate text boxes of content. It would be a good idea to have a variety of different points (maybe more then needed), not all points have to be used. The idea is that students have a choice of which points they use. They can then check with mark schemes and with the teacher to identify if there is enough content and whether further amendments are necessary. 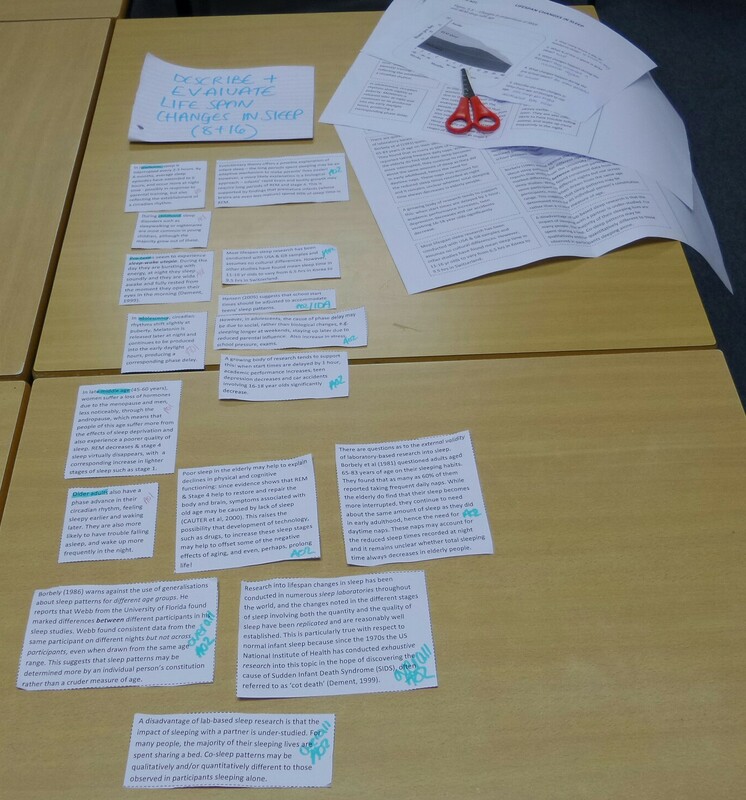 Once done, instead of sticking the text boxes on a sheet of paper, learners can simply layout their created essay on the table and take a picture on their phones (it saves paper and provides a valid reason for them to use their phone in class). I managed to get learners to send me photos of their work in class and I was then able to put them up on the projector during the same session and this allowed for further whole-class discussion and reflection on the experience. Using different model essays for each table, having different graded essays representing a high middle and low mark to construct and then using the mark scheme to grade each one with the assistance of the teacher. Using text boxes on different colour paper to identify description and evaluation content may be useful. If they are laminated text boxes they can be used over again with different classes and by different teachers in a department. Thanks Caroline for the resource material that I used recently in class- See photo. So by all means give a model answer, but get them to work for it!